Did I just really just say dinner in the title? Noooo! I'm a die-hard SUPPER supporter in every supper vs. dinner debate! But man, 'supper rolls' just doesn't have the same ring as 'dinner rolls'. I suppose I will concede, just this once. Seriously, though, these rolls have become my family's favorite. What started out as a quick yeast roll recipe has been tweaked and morphed in a no-knead recipe that tastes, just WOW. I'm a lazy bread-maker, I admit; I want fast-as-possible-with-little-work. As far as ease goes, these are just a step down from the frozen rolls you can buy at the store. Yet, they don't taste any different to me than the rolls that require kneading. Actually, out of all the roll recipes I've ever tried (some complicated, with steps that require boiling milk, and long rise times), these are the most delicious. Pillowy and soft, subtly sweet and lightly rich, and so beautiful coming out of the oven, these rolls are perfect for those soup-for-supper nights. I've used them as burger buns, too, when I was in a pinch and couldn't get to the store. They are also relatively QUICK. A lot of no-knead recipes require hours of rise time, but these rolls can be ready to go in the oven in about an hour. You can also start them the night before and place the dough in the fridge, if you are the type who plans ahead (I'm working on that!). The next night as you start your meal, you can pull the dough out of the fridge and get the rolls into the oven within an hour. SO heavenly good with soup! The recipe makes 6-10 rolls depending on how big you make them. This is the perfect amount for an average family like mine, especially since we aren't huge fans of leftover rolls. If your family is bigger, or hungrier for bread, by all means double the recipe. I typically get 6-7 large rolls from one batch of this yummy dough. *You can try to use a portion of whole wheat flour. I have substituted up to half whole-wheat for regular--but I'll warn you, the rolls will not puff up as much. For the fluffiest and most delicious rolls, use all white, or even bread flour. I like to use organic, unbleached flour whenever I'm not using whole wheat. Like most of the popular no-knead recipes for loaves of bread, the dough is very sticky, but not so much that it can't be handled with a bit of flour. I like to lightly oil my baking sheet with coconut oil, then rub the oil into my palms before I dig into the bowl of dough to shape my rolls. If you find the dough just too sticky to work with, refrigerate it for awhile. 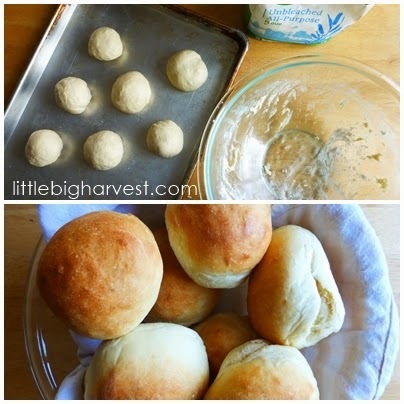 Keep this simple recipe in mind the next time you feel like your dinner--er, SUPPER--could use some fresh delicious rolls! Stir until dry ingredients are incorporated. The dough will be very sticky, but that's ok--no kneading is required. Cover bowl with damp towel and let rise until doubled, 30 mins to an hour. At this point you can put the bowl in the fridge for later, or continue to next step. If you stored in fridge overnight, take it out while you begin to prep your meal. It will be ready to shape into rolls within minutes. Oil a baking sheet. I use coconut oil on the sheet and then all over my palms so that it's easier to deal with the dough. Sprinkle a generous amount of flour over the top of the dough (this will make it so much easier to deal with) and then take a small handful of dough to shape it. Watch the video above; shaping is actually very simple. Place each roll pinched-side down on the baking sheet, then set aside to rise. I usually let mine go for 30 mins or less...the rolls will be more puffy if you have the time to let them rise for an hour, but I usually just don't have the time! :) Preheat the oven to 425. Once rolls are risen, bake for 10-12 mins, until beautifully golden brown. 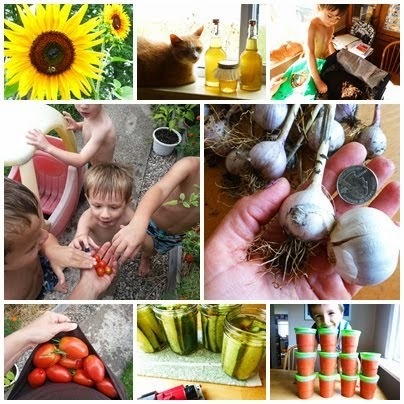 This post was shared at the Homestead Blog Hop!